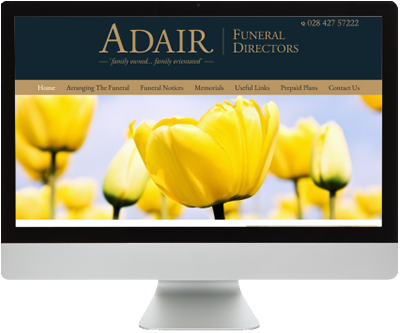 Adair Funeral D irectors is an independent, family run business based in Ballywalter and servicing the whole of North Down and the Ards Peninsula. Funeral Director Warren Smith and his wife Ann Adair-Smith are dedicated to providing a caring professional and dignified service at what is always an emotional time for families. With the help of Smith Design Agency we built a full brand and website for the business that describes all the products and services offered including an interactive feature allowing you to sample the various headstones and memorials offered. The site can be updated in-house where funeral noticed and announcements are added quickly and easily. Visit the site today at www.adairfuneraldirectors.co.uk.